Bengaluru: Former Chief Minister and BJP’s CM candidate in the upcoming Assembly elections, B.S. 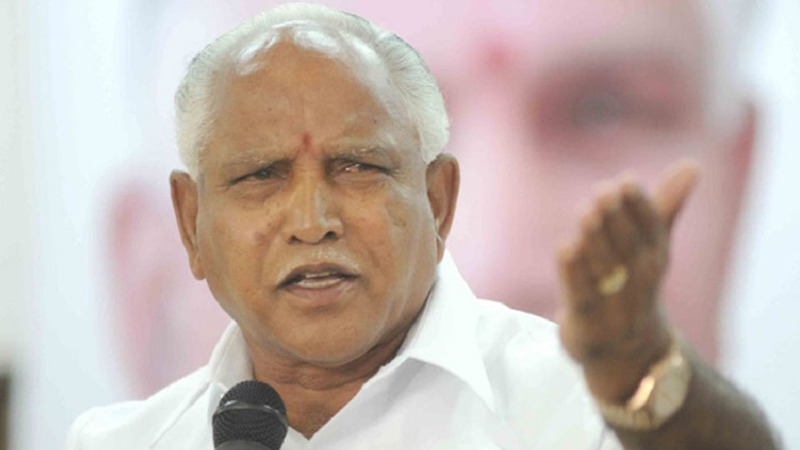 Yeddyurappa, has taken legal recourse against the constant references made by Congress leaders about his court cases. Heckling Yeddyurappa by referring to his jail stint and corruption cases has become a favourite tool of Congress leaders, including Chief Minister Siddharamaiah to rile Yeddyurappa. This has happened online as well on public platforms. Yeddyurappa has now approached the High Court against various Congress leaders and also the media, which have reported these allegations. In his petition, Yeddyurappa has urged the High Court to issue directions to restrain the media from publishing defamatory statements made by Congress leaders including CM Siddharamaiah with regard to cases already closed and the cases pending against him before the courts. Hearing the petition, Justice G. Narendra ordered emergent notice to the Press Council of India and the regulatory body for TV broadcasters, but refused to pass any interim order. “After hearing the petition, this court is of the opinion that this case is appropriate to make PCI and the TV broadcasters’ regulatory body as parties. Admittedly, there is a larger issue. Therefore, issue emergent notice to them”, the Judge said before adjourning further hearing to March 23. As the court refused to pass an interim order, senior Counsel C.V. Nagesh, representing Yeddyurappa, said at least the Court may pass an interim order as far as media is concerned, if not against private parties at this stage, as damages can be claimed from them if they issue defamatory statements, he said. The court observed that it is also not happy with the allegations. Meanwhile, Yeddyurappa has tweeted yesterday that he would give a “Breaking News” for the people of Karnataka at 5 pm on Mar. 16 (today). His tweet has given rise to a lot of speculation at a time when Karnataka will face elections in a month or two. Now willing to file defamation cases against those who say truth!! Mಕರ್ನಾಟಕದ ಜನತೆಗೆ ಇತ್ತ ದರಿ ಅತ್ತ ಪುಲಿಯೆಂಬಂತ ಸಂಧಿಘ್ದ ಪರಿಸ್ಥಿತಿ ಎದಿರಾಗಿದೆ. ಆ ಕಡೆ ನೋಡಿದರೆ ಅಯೋಗ್ಯ ಸಿಧ್ದರಾಮು ಈ ಕಡೆ ನೋಡಿದರೆ ಠಕ್ಕ ಎಡಿಯೂರಪ್ಪ, ಮದ್ಯೆ ಲೂಟಿಗಾರ ದೇವೆಗೌಡನ ವಿಷಬೀಜಗಳು. ಭುವನೇಶ್ವರಿನೇ ಕಾಪಾಡಬೇಕು ನಮ್ಮ ಜನತೆಯನ್ನ.